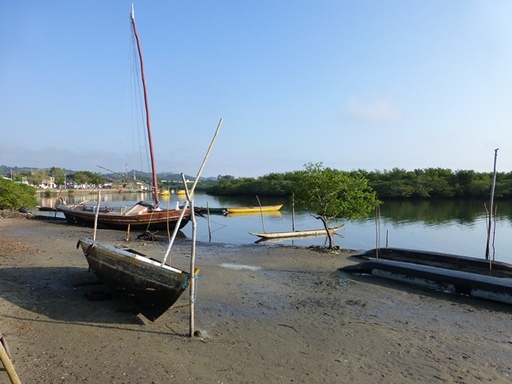 In Itaparica there were beautiful old colored buildings, long beaches and nice people were waiting for us. In the marina we met also SY Ocean Maiden. Tjarda and Chris donated us 4 new life wests for our kids. Thank you so much! After short time we discovered a little hidden place where Nathalie and her husband make their own homemade chocolate. In their big back garden they have their own cacao trees. After the barking dog let us in at the front door, Nathalie cut us 3 different chocolates to taste. One better than the other. So in our time in Itaparica we always found a reason to give them a quick visit. Salina, Andri and Noe had the opportunity to dance the typical Brazilian fight dance Capuera twice a week in a friendly Capuera house. 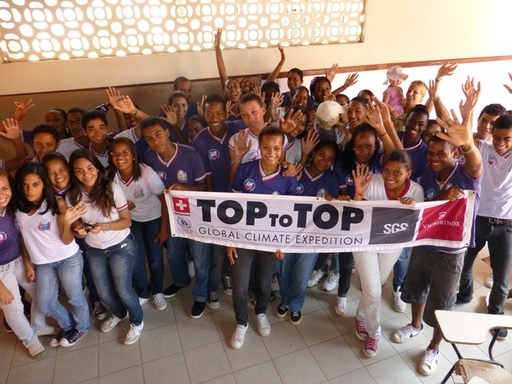 That’s how we met other Brazilian kids from the island and we could visit them in the schools. 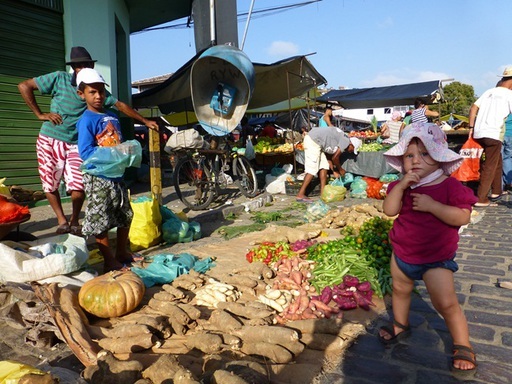 We heard from the famous market up the river Paraguacu where everyone meets early Saturday mornings. Wooden donkey buggies bring the fresh fruits and vegetables. 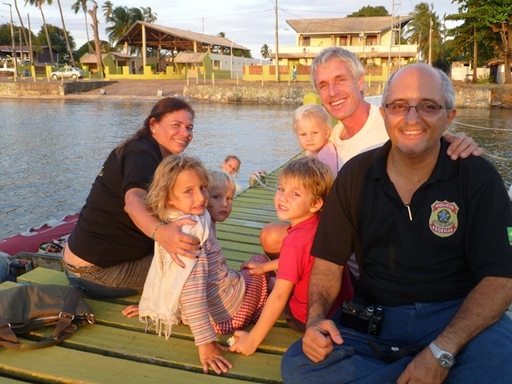 We arrived Friday late afternoon in Maragogipe and made a little walk through the village. Dozens of kids let their self-made colorful kites flying in the air; often made out of rubbish. 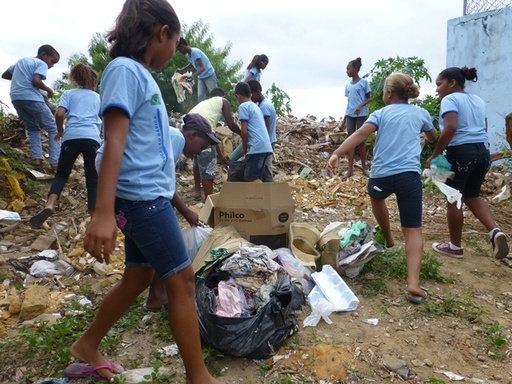 The village is quite clean and they have one of the best recycling collection site in Brazil. After a short night we were ready at 6 am for the market to dive into the Brazilian culture and to stock up our fridge before the next passage. Amazed by all these people, noises, smells, colors, chickens and dogs, we squeezed into the market. Our children already used to these kinds of things didn’t even shrink back from a bloody cow head lying on the floor. They just hold their noses if necessary. After a big shopping we had the opportunity to meet a Brazilian politician in the middle of the market. Because the elections are coming up soon, every politician is campaigning for themselves with decorated cars driving through the streets with very loud music coming out of a loudspeaker installed in the trunk. So we already knew her name and told her about our project. On the way back we stopped in a little place along the river to visit a waterfall in the rain forest. Ready with our hiking shoes and water bottles, we wanted to start our little adventure. Luckily a woman stopped us just in time and warned us that there are a lot of poisonous cobras around and that her dog just died a day before of a snake bite. We put garlic on our legs to frighten off the snakes and walked carefully back to the boat; grateful that nothing bad had happened. Back in Itaparica our friend and photographer Stefan from Rio joined us for the sail up to Cabodelo. His video of the trip will coming soon. 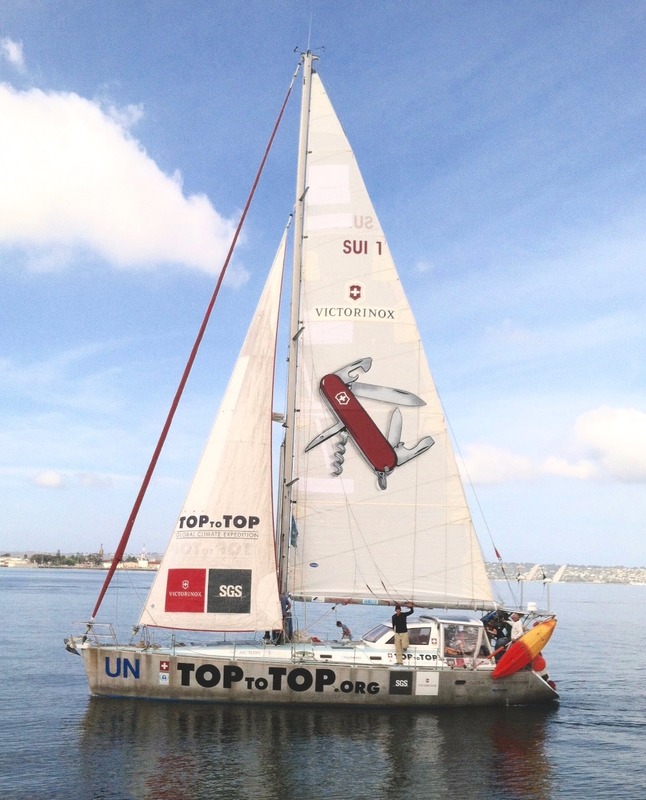 – Before we sailed we cleaned the hull, so we needed for the 520 nm only 4 days. 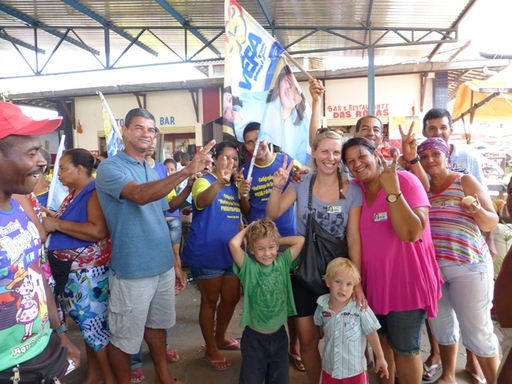 In Itaparica we were warmly welcomed by Luiz Fernando, the local Federal Police person. He became a friend and was able to make contacts with officals in Fernando de Norohna Island. Luiz may join us again in Alaska? 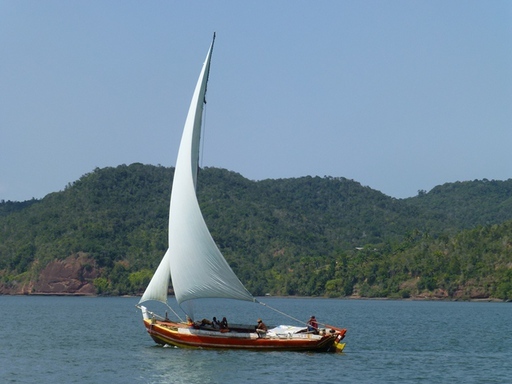 At the moment we are getting ready to sail to Fernando de Noronha where we hopefully can do our last presentations in Brazil. 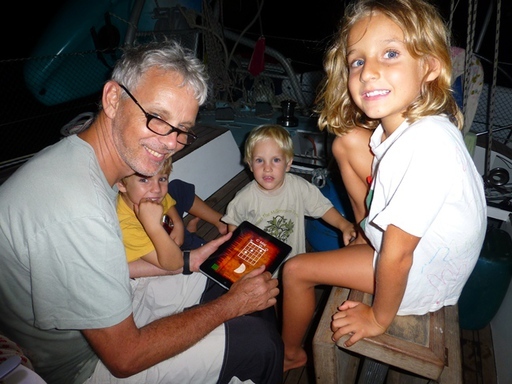 Thomas Lohbeck, our friend and web-designer, just joined Pachamama, so the crew of 8 is complete.